The Assore Balwin Parkview Open saw Alex Fuller taking her 2nd PSA title. She started the match with a good length and kept the rallies long and hard. Milnay Louw moved very well and match see-sawed between the 2 players. Fuller managed to take the first game in a closely contested battle. The 2nd game saw her calm down and her length got better. Louw was not going down without a fight and kept her composure and determination to claw her way back and take the 3rd game. Fuller played confident attacking squash and eventually the pressure took it’s toll on Louw who gave away a couple of strokes at crucial points. It was wonderful to watch such talented squash players in the men's final. Both players moved with such grace around the court. Their agility and movement to the ball had the crowd in awe. In the men's final Mohammed Elsherbini played accurate attacking shots that most players would not have reached but the young Velavan Senthikumar glided effortlessly across the court. After a few controversial decisions by the referees both players started playing loose balls and the game got a little scrappy. ElSherbini managed to regain his focus in the 4th and pulled ahead 8-4. Another 3 very long hard rallies saw Senthikumar desperately trying to go for the unbelievable winner but unfortunately it did not pay off. 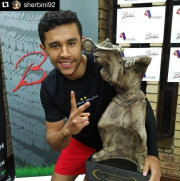 Said ElSherbini ,”I am thrilled with my 1st PSA title. I hope that this will be the first of many more to come. I would not have been able to achieve these goals without the support of my family and coach Lefika Ragonsle. The first game was very hard and Senthikumar kept the rallies long and hard. Fuller was definitely struggling with the altitude. The first game lasted over 15mins and Fuller worked really hard. Senthikumar played a great length and kept attacking the ball. When interviewed after the match Senthikumar said, “I am so excited to be in my 1st PSA final went. I think that my tournament has gone really well and felt very good during the games. I also struggled a little with the altitude but I attacked a lot and made him work harder than usual. I have never played either of the other semi-finalists and really looking forward to the match tomorrow !”. Unseeded Egyptian Mohamed ElSherbini played positive aggressive squash from the first point to beat second seed Harinderpal Sandhu. He kept the ball tight and to a good length and took no chances with any fancy shots. Harinder looked like he felt the pressure and made too many unforced errors at crucial points. In the ladies event Alex Fuller and Milnay Louw set up an all-SA final. Fuller was very focused for this match. From the beginning she hit a good length and moved well to the ball. Top seed Nikki Todd was struggling with her length and then started to panic, going for winners but making errors instead. Fuller stuck with her game plan and even though was 9-6 down in the 3rd game back to take the game 13-11 and the match 3-0. Louw was definitely on a mission tonight. She was clinical in her shot selection and had Cheyna Tucker running from corner to corner. She did not give Tucker any opportunity to get into the game at all. Louw said “ I concentrated on playing my drives deep thereby putting pressure on Cheyna in the back corners. This opened the court up for me and gave me the opportunity to play short when I needed to. I felt I moved well and played the ball to a good length. I kept up the momentum throughout the match and was very happy with my performance”. The top seeded ladies all made it to the next round with ease. The hardest fought match was the Sunaya Kuruvila from India who kept Milnay Louw on the court the longest. Louw showed that experience does count and even though the youngster tried her hardest could not compete with experience. Fuller was just too strong and fit for compatriot Peloakgosi and was only kept on the court for 13mins. Once again the men’s matches were very entertaining and real crowd pleases. Mohamed ElSherbini stepped his game up to another level this evening. After battling to find a good length in the first 2 games ElSherbini took his game up a notch and his superb length put Potgieter under such immense pressure that he could do nothing with the ball. Even though Potgieter was diving all over the court he was not a match for his opponent who took the last 2 games 11/2, 11/0. Velavan Senthikumar proved that he is a player to be reckoned with after ousting out the number 1 seed Aqueel Rehman. His incredible length and casual attitude on the court has endeared the SA crowd. He is never flustered and has the ability to read the game so well. It feels that at times he is volleying every short before it gets to the half way line. His anticipation and attacking game has just put all his opponents under extreme pressure and even though he is extremely young he plays with the experience of a veteran of the game of squash.